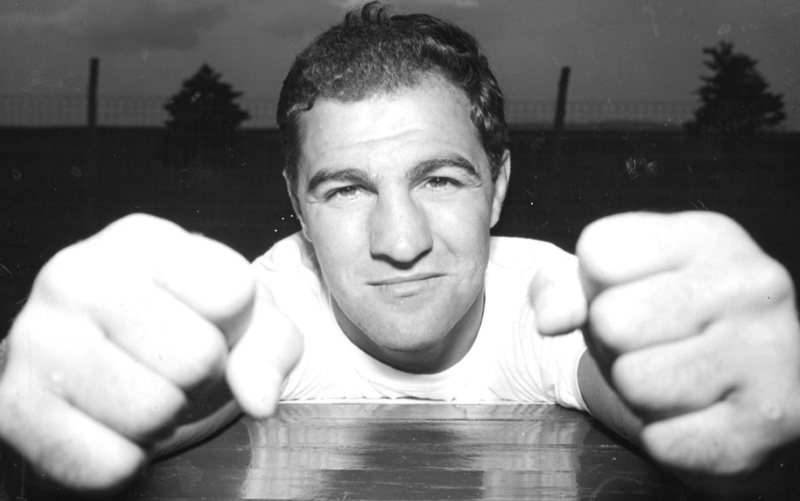 A product of the Army and amateur ranks, Rocky Marciano was born on September 1, 1923. He takes his place alongside Dempsey and Louis as one of the great heavyweights. Marciano was born and raised in Brockton, Massachusetts, to parents who were immigrants from Italy: when he was about eighteen months old, Rocky got pneumonia, from which he almost died. When Rocky grew up he worked as a chute man on delivery trucks for the Brockton Ice and Coal Company. He also worked as a ditch digger and as a shoemaker. Rocky was also a resident of Hanson, Massachusetts; the house he lived in still stands on Main Street. At school Rocky played both baseball and football, but was subsequently kicked out for forbidding the rules, playing for a church league which violated his school rules by joining other teams. He then dropped out of school when he finished tenth grade. After failing to find a spot on another team, he returned to Brockton and began boxing training with long-time friend Allie Colombo. Al Weill and Chick Wergeles became Rocky’s managers, while Charley Goldman was his trainer and teacher. In March 1943, Marciano was called up to the army to serve for two years. He was placed in Swansea, Wales, where he helped ferry supplies across the English Channel to Normandy. After the war ended, he completed his service in March 1946 at Fort Lewis, Washington. As an amateur Marciano’s record was 8–4, he represented the army and won the 1946 Amateur Armed Forces boxing tournament. His amateur career was interrupted on March 17, 1947, when Marciano stepped into the ring as a professional competitor. That night, he knocked out Lee Epperson in three rounds, after Marciano returned to the amateur ranks and fought in the Golden Gloves All-East Championship Tournament in March 1948. He was beaten by Coley Wallace and competed in the AAU Olympic tryouts in the Boston Garden. Coley Wallace defeats Rocky Marciano in this amateur fight. There, he knocked out George McInnis, but hurt his hands during the bout and was forced to withdraw from the tournament. That was his last amateur bout. Marciano began fighting permanently as a professional boxer on July 12, 1948, he won three more fights by knockout and then he met Ted Lowry (58–48–9), who, according to many scribes and witnesses, probably managed to win three or four of the ten rounds from Marciano. 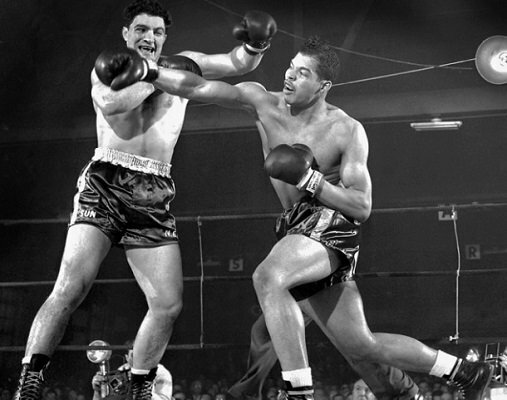 Nevertheless, Marciano kept his winning streak alive by beating Lowry by unanimous decision. Four more knockout wins followed, including a five-rounder on December 19, 1949, with Phil Muscato (56–20–0), an experienced heavyweight from Buffalo, New York, and the first “name fighter” Marciano would face. 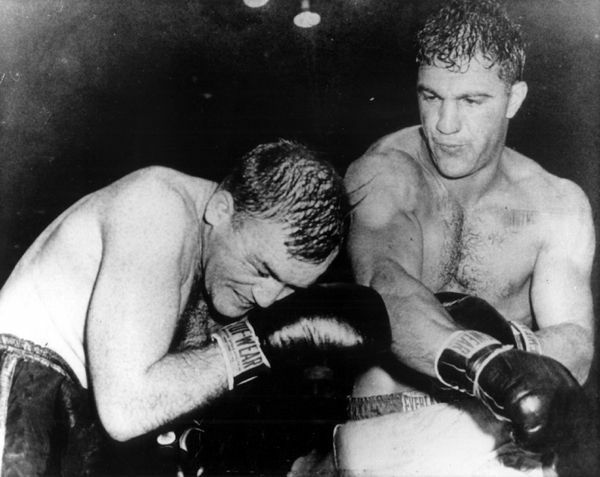 Three weeks after that fight, Marciano beat Carmine Vingo (16–1–0) by a fifth round knockout in New York that almost killed Vingo. A fighter with iron-fists, he was the only heavyweight who went through a career without a loss. Starting as a professional in 1947, he scored forty-nine victories, forty-two by knockouts and retired undefeated. Yet it was not until he fought Roland LaStarza in 1950 and gained a disputed decision that he became a headliner. Marciano continued to rise, shunting to the sidelines mediocre talent until mid-summer 1951, when his knockouts of Rex Layne in six rounds and Freddie Beshore in four brought him onto the championship spotlight. On Oct. 27, 1951, the 28-year-old Marciano took on the 37-year-old Joe Louis and he continued his rise by handing Joe Louis a terrific beating, stopping the erstwhile Bomber in the eighth round after which Lee Savold, Gino Buonvino, Bernie Reynolds and Harry Matthews were put out of the picture. With those triumphs he was now ready for a shot at the world crown, where he would face Walcott. “Marciano is an amateur,” Walcott sneered. “If I lose I deserve to have my name taken out of the record books.” The two men met in Philadelphia’s Municipal Stadium on Sept. 23, 1952. The champ was making the challenger look like a fool, who steadily built up a points lead; but in the thirteenth, but then, half a minute into the 13th round, Walcott used his trademark feint to set up his right hand, but Marciano’s “Suzie Q” landed first, Walcott got hit with a sledgehammer and that was all she wrote. 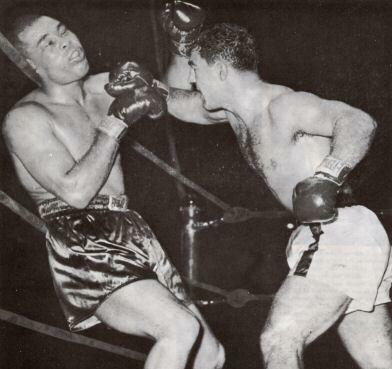 Marciano landed a glancing left hook as Walcott slumped to his knees with his arm draped over the ropes. He lay motionless long after he had been counted out and Marciano became the new World Heavyweight Champion. At the time of the stoppage, Walcott was leading on all scorecards, 8–4, 7–5 and 7–4. 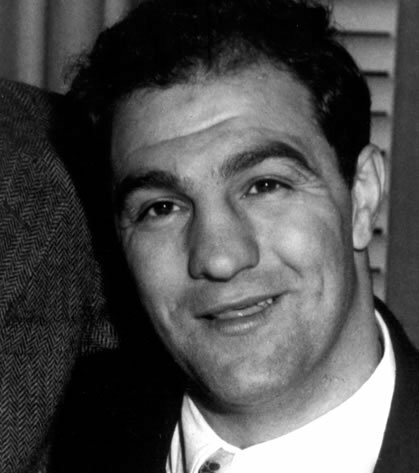 Marciano defended his title six times. In his initial defence, a return bout, he knocked out Walcott in the opening round of a disappointing fight in Chicago. Four months later, he in New York, he disposed of Roland LaStarza in the eleventh round. The following year he fought two thrillers with Ezzard Charles. In the first, on June 16, 1954, at the Yankee Stadium, Rocky retained the throne, gaining the decision in fifteen rounds; and in the second fight, on September 17, in the same arena; Ezzard was knocked out in the eighth round. Each bout was replete with action and drama. The knockout was a stunner; the power behind Rocky’s punches was in evidence. Then came the international championship mill in San Francisco where he easily stopped Don Cockell, British Empire champion, in the ninth round and followed that with his farewell fight, a contest in New York on September 21, 1955. 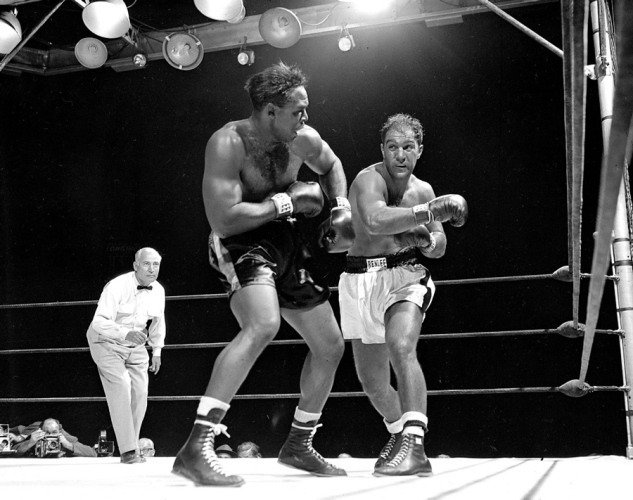 Marciano stopped Archie Moore, holder of the light heavyweight crown, in the same number of rounds. With that knocked ended the brilliant career of the Brockton Blockbuster. Only one other heavyweight king retired undefeated and made it stick, Gene Tunney. 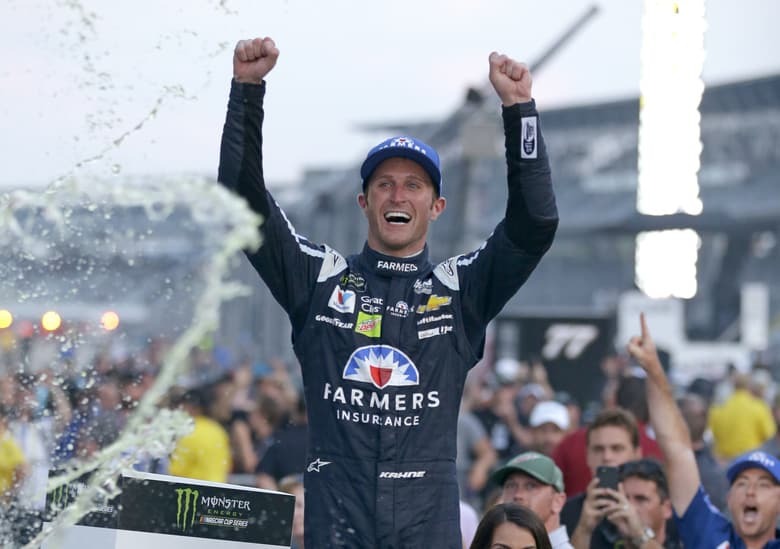 His six title defences netted Marciano purses totalling $1,462,961, with his pre-championship income plus his side income following his rise to the top, his earnings were well beyond the $2,000,000 mark. John L. Sullivan popularized boxing in the United States; James J. Corbett set the model for scientific boxing; Jack Dempsey set the record for million dollar gate; Joe Louis established an all-time record for title defences; and Rocky Marciano is hailed as the only heavyweight king who not only won every bout in which he engaged as a professional but hung up his gloves with that clean slate and stuck to his decision. 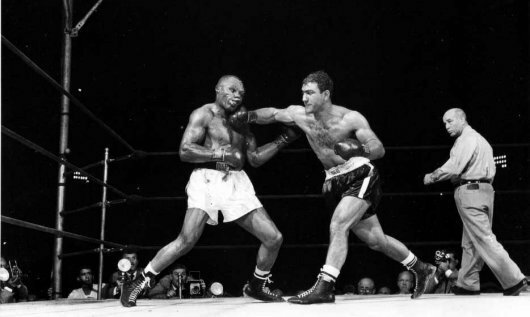 Marciano’s retirement brought about a world elimination in which Archie Moore received a bye and Floyd Patterson and Tommy (Hurricane) Jackson entered the final elimination, with Floyd winning a split decision. Under manager Al Weill piloting, Rocky rose to the top of the heavyweight division and divided a fortune with Weill. From 1947, when he began as an unknown preliminary boy, until he retired in 1955 as champion he was never once defeated. Marciano was knocked down to the canvas only twice in his professional career. The first occurred in his first championship against Jersey Joe Walcott, 38, and the second occurred against Archie Moore, 38. 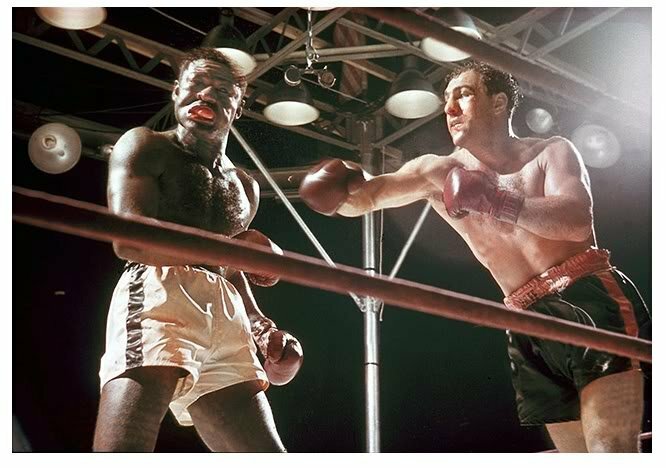 Rocky Marciano met his untimely death when he was on his way to Des Moines, Iowa to support a former high school sports star who had known Marciano since childhood, he was opening an insurance business venture and a surprise party was awaiting him. During the flight, the plane ran in to some difficulty and he was killed in a plane crash in Newton, Iowa on August 31st in 1969, the day before his 46th birthday. From there Marciano intended heading to his home in Fort Lauderdale, Florida, to celebrate his 1st September birthday with his wife Barbara, daughter Mary Anne, 16, and 17-month-old adopted son Rocco Kevin. He is interred in a crypt at Forest Lawn Memorial Cemetery in Fort Lauderdale, Florida. His wife, who died five years after him at the age of 46, is entombed next to him. His father died in March 1972 and his mother in early January 1986. Marciano was on his way to give a speech to support a friend’s son and there was a surprise birthday celebration waiting for him. He had hoped to return early morning for his 46th birthday celebration with his wife. 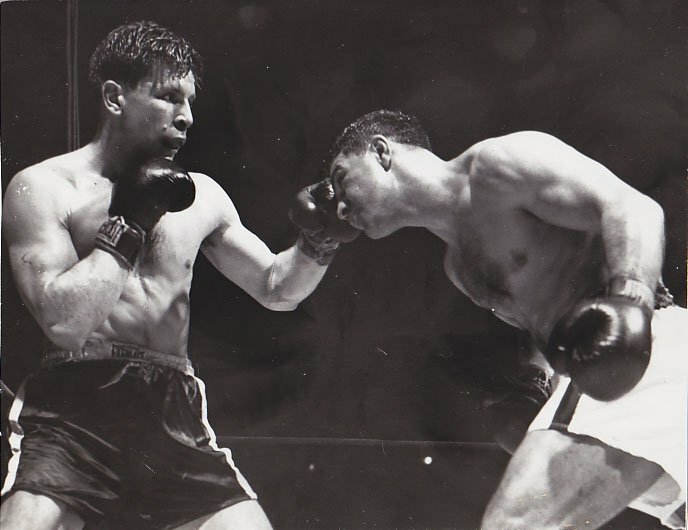 Marciano crowned fighter of the year by Ring Magazine three times, his three championship fights during 1952–54 were named fights of the year by that magazine. In 2006 Marciano’s 1952 championship bout against Walcott was polled as the greatest knockout ever. 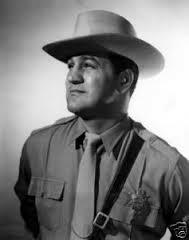 Marciano also received the Hickok Belt for top professional athlete of the year in 1952. In 1955, he was voted the second most important American athlete of the year. 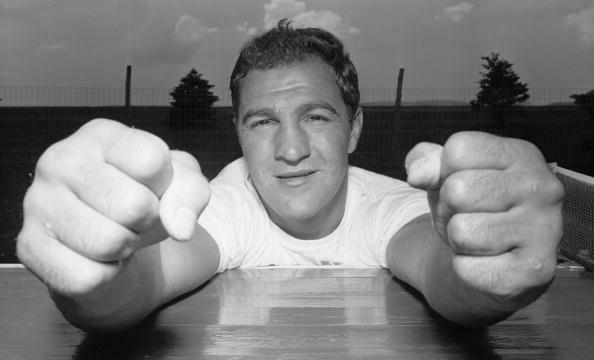 Rocky Marciano was the inspiration for the name, iconography, and fighting style of the title character Rocky Balboa from Sylvester Stallone’s American classic ‘Rocky’ movie series. The character Rocky dreams of becoming like his idol Rocky Marciano, later in the series he even gifts his son a ‘valuable possession given to him by Marciano himself’. Marciano is a member of the International Boxing Hall Of Fame. Conflicting memory….his wife and daughter were at home when he died, in an attempt to fly home for his birthday.